Late summer is the season for nibbling delicious blueberry muffins and sipping an afternoon cup of tea, while relaxing in an over-sized wicker chair on a wraparound porch overlooking lush gardens of blooming flowers. But do you know how simple it is to transform your favorite summertime snack into a new one for autumn? In September the markets begin to fill their shelves with packages of beautiful, ripe cranberries. Many people walk right by them with the notion that they are meant to be turned into cranberry sauce and served as a traditional accompaniment to their Thanksgiving turkey. To some degree they are right; the tart taste of the cranberry is mitigated by the sweet jelly creating a wonderful complement to poultry dishes, but cranberries are surprisingly quite versatile. Cranberries appear in salads, sauces, side dishes, soups and are especially wonderful when baked into savory or sweet desserts to be enjoyed throughout autumn and the winter months. 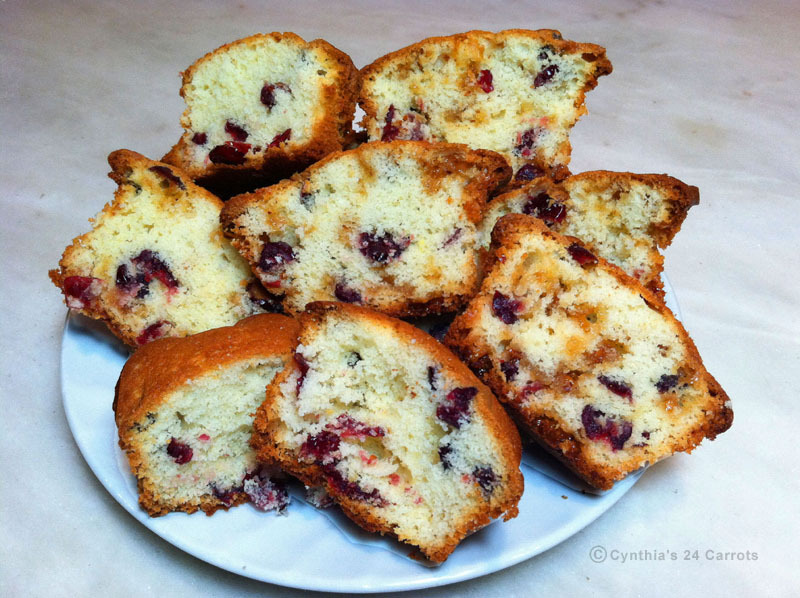 My favorite and effortless way to prepare cranberries is to bake them into muffins; the tart taste of the cranberries juxtaposed with the sweet batter is simply delicious. I bake two very different version of muffins to enjoy during the autumn, on is a traditional muffin and the other is far sweeter and baked to serve as a dessert or special treat. Serve these muffins in the early afternoon along with a cup of tea while sitting in front of large a picture window, and take in the magnificent view of the vast array of colorful leaves clinging to the branches of the trees until they can no longer hold on, announcing that the fall season has begun! Sift flour, baking powder and salt together into a medium bowl and set aside. Beat butter and sugar on medium speed until light and fluffy. Add eggs, one at a time blending until incorporated. Add the dry ingredients alternately with the milk mixing just until the ingredients are absorbed. Stir the cranberries in by hand. Scoop ¼ cupfuls of the batter into prepared muffin pans. Bake at 375°F for 20 – 30 minutes or until golden brown or a wooden pick inserted comes out clean.